When you are sick or need to research a disease for an ailing relative, the two best places to go online are health search engines like Healthline or patient support group sites like Daily Strength. Tel Aviv startup iMedix wants to combine both: a vertical health search engine with a patient-to-patient social network. Tomorrow it officially switches to beta, although the previously invite-only site has been open about a week. 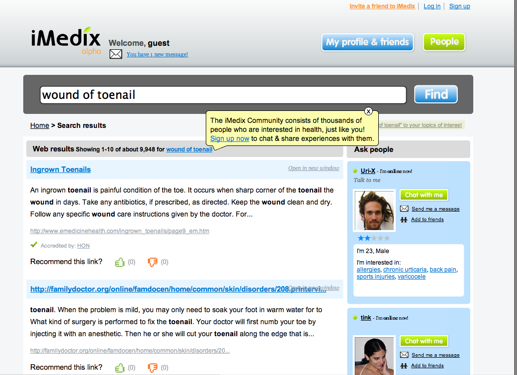 iMedix is a social search engine focussed on healthcare that has raised $2 million from angel investors. When you type in a search term, an auto-completed list of health and medical terms pops down to help guide your search. Type in “toe,” and it suggests “wound of toenail,” “tingling toe” “broken toe,” “blue toes,” “absence of toe,” and “hammer toe,” among others. Along the side column are profiles of iMedix members who may be interested in health topics related to the search. In this case, “sport injuries.” If the iMedix members are online, you can start a chat with them. If they are not online, you can send them an e-mail. Each member creates a profile with as much or little information as they like, including tags indicating what health categories, diseases, and medical conditions they are interested in. These tags are informed by the same auto-complete database used for search terms so that both people and search terms can be matched more easily. The other social aspect of the site is that each search result can be voted up or down. The site is based on the open-source Lucene search engine, which then gets trained by the users to generate better results. You don’t need to be a member to use the search engine. Anyone can vote a result up or down. But a member’s vote carries more weight, and the more active members carry the most weight. 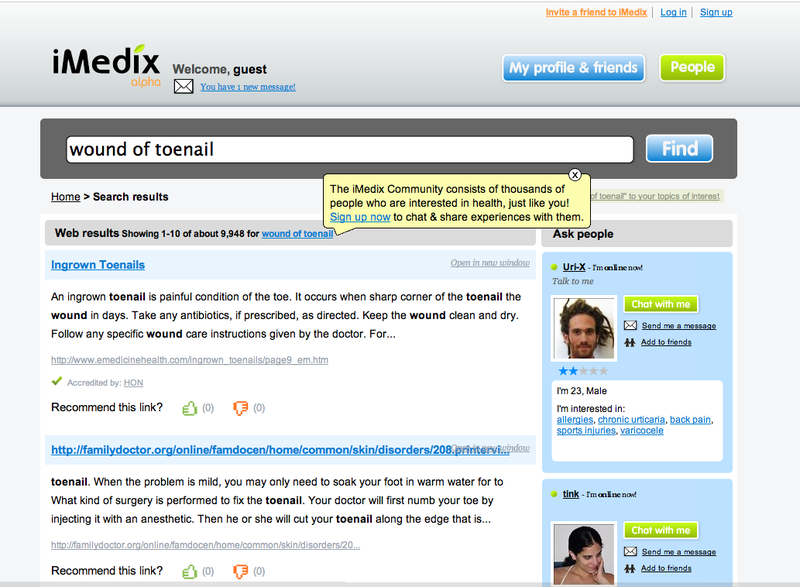 The original concept for iMedix was a blogging platform for patients. That has evolved to more private forms of patient-to-patent communication, coupled with a health information resource that all members can help make better. Blogging will probably be worked back into the site, but erring on the side of privacy to begin with is a good idea. Although, all that valuable information in the one-on-one chats is being lost. Perhaps there should be an option to make chats public if both parties agree and think that others can benefit. There should also be the ability to vote on people to help sort out who are the best authorities on a topic-by-topic basis. But all in all, iMedix is off to a healthy start.